Entire recipe yields 3 servings. First, chop up the onion and crumble up the tempeh. I crumbled the tempeh by chopping it into small cubes and then crumbling it with my hands. Next up, heat a pan over medium heat and cook the onion until translucent, about 5 minutes. Once the onion is starting to look clear, add in the crumbled tempeh and mix it together with a spoon. Cook for another 5 minutes until tempeh is starting to brown. Last, add in your frozen bell peppers and fajita seasoning, and stir it until combined. Because I used frozen peppers, I didn’t need to add any water to the dish since they give off enough on their own. If you use fresh peppers you’ll want to add a little water so it doesn’t get too dry. Cook for a total of 10 more minutes until the peppers are heated through. Do ANYTHING you can think of with this filling. My dinner of choice last night was to have it stuffed in a pita with light shredded mozzarella, and it was deliiiiiicious. It seriously felt so indulgent to be eating that, almost like a cheesesteak! As pictured, that was 9 PointsPlus (6 for the filling, 2 for the pita, 1 for the cheese) and it was sooo satisfying. For lunch today, I’m eating it as a taco salad over spinach with cheese and salsa. Can’t wait! What’s your favorite meal to make in 20 minutes or less? One of my June Goals was to go back to Weight Watchers, which I did on June 24th for the first time since early April. I had gained 3 pounds in the 3 months that I’d taken a hiatus from going, which is not too bad considering that I didn’t count points and did a lot of drinking and having fun. I have been on WW since March 2009, and have basically been the same weight since January, so it’s really time to just push forward and get to my goal weight already. With my weigh in at the end of June, I had 9 pounds to go to get to my goal weight. I skipped weigh in (WI) last week because I had a really busy day at work and had meetings over lunch, but I went back today. During those two weeks, I lost 2.6 pounds!! I was so happy to see a pretty significant move on the scale since I haven’t seen one of those in ages, and this means I only have 6.4 pounds until I’m at my goal weight! I’d like to put out there that my personal goal weight is 4-14 pounds lower than my WW goal weight, but I’m not really in a rush to get there, I just think my body will naturally get there once it’s ready. I am in a rush to get to my WW goal though, so that I can become a lifetime member and stop paying! I’d also love the opportunity to be a Leader and run the meetings, and you have to be Lifetime in order to do that. Workout 5 times – Friday, Saturday, Sunday, Tuesday, Wednesday. I’m flexible with what I do, but I’d like to do the Shred at least once, Bikram at least once, and run 2x. Finalize My Half-Marathon Training Plan – The half marathon is somehow only 11 weeks from this weekend!! I will share my plan once it’s developed fully, but this week is the week I have to do it! Limit Alcohol – Saturday night I’m celebrating my birthday with my friends, first with a birthday dinner and then going out on the town, so that night there will be plenty of booze (and it will also be my “free” day). Besides that day, I’d like to keep drinking to a minimum. My eating habits and drinking tend to go hand in hand (as in eat bad and way too much when I drink) and I don’t have any other special stuff going on so it should be doable. Lots of Water – I’ve been OK about this most of the time, but in this intense heat its even more important to get a lot of water in, and I think getting sick on my birthday night had a lot to do with not drinking enough water. 8 cups a day minimum, and more when exercising. Lunch today was a loaded salad that was deeeeelicious. This salad was really big and satisfying since there was so much going on. I rubbed the oil onto the kale and it was the first time I tried the Garlic Gold Oil and it is AWESOME. There is garlic at the bottom so the whole jar is really flavorful and added a nice kick to the salad. Do you set daily, weekly, or monthly goals for yourself? What are you currently working on? Do you find they help you stay on track or just get you overwhelmed? I’ve just recently started setting shorter term goals and I like it because they are easier to stick with than my big goals like “get to goal weight” and help me make mindful decisions. I found these Flatout Wraps in the depths of my freezer and have been loving them lately. I have a ton of groceries right now due to all my excursions to farmer’s markets and the asian grocery store, so I’m trying to use up what I have before going to the store again. So today, I got a little creative with my lunch and it worked out great. To start, I had a flatout wrap with spinach from the farmer’s market and 1/2 serving of soy tempeh. When I was packing my lunch this morning, I wanted something else for the wrap to give it some flavor and fun when I spotted the leftover breakfast corn and potato hash from Monday morning. I grabbed it and decided it would make a good addition to the wrap because it tastes so good! I had two large carrots on the side, but forgot toothpicks to hold this massive wrap together. I also threw together a random little radish salad last night, where I took 6 radishes (also from the Farmer’s Market) added some rice vinegar, a little salt, and a tiny drizzle of evoo. Because it sat overnight, the red from the outside of the radish bled into the insides, so the whole salad was pink. It was delicious, but next time I’d make it in the morning so it was easier to look at. For “dessert” I had some fresh strawberries. It was a delicious, satisfying, and colorful lunch! A few people have been asking me about the bike I bought, how much it was, what I had to buy to go with it, whether I like it, etc etc. so I figured I’d take this opportunity to tell you a bit about my bike! I need to take some more pictures, which I will post soon, but I bought a Diamondback hybrid. A hybrid is a cross between a mountain and a road bike, and in my opinion is the best of both worlds (unless you want to race – then you should get a road bike!) The tires themselves are much thicker than road tires, but they are still pretty narrow so I can go relatively fast in it. Because I ride on trails that are not just pavement but have dirt, bridges, roots, etc, the tires are sturdy enough to go on all sorts of terrains, but isnt as slow as a mountain bike. My bike was used and cost $200 – it had new tires, new handlebars, and was fully tuned and ready to ride. If you’re in the DC area, I highly recommend going to the market where I bought mine (Craig’s List ad here) because they have about 40-50 bikes at any time and the guys are very knowledgeable and helpful. They let you ride the bike around and test out different bikes so you can get a feel for what you like best, and they guarantee the bike for 90 days. If anything happens to it, you have any questions, it just doesn’t feel right (or anything other scenario you can dream up!) you can bring it back to them and they will fix it, tune it, or let you pick a new bike. Helmet – This goes without saying! You must, must, must MUST wear a helmet! It’s so dangerous and honestly not worth it not to! One thing I recently learned is that helmets are only good for one hard fall – so if you have a tumble on your bike (which you inevitably will) replace your helmet. Even if it stays intact and looks OK from the outside, they are only designed for impact once, and much better to be safe than sorry! Padded Bike Shorts – A must in my opinion! I got mine off Amazon.com and they were under $30 and make a world of difference when riding. A comfy seat – If your bike doesn’t come with a comfortable seat, I highly recommend checking out amazon.com, a bike shop, or Target (where I bought mine for $20!) to get a new one. It makes a world of a difference. Air pump – This is a must that you have to buy along with your bike or very soon after. You’ll need to put air into your tires after every ride or two, so you need an air pump! Bike Lock – This is essential if you plan to leave your bike unattended at any time – – to go to the bathroom or into a store if you bike somewhere, if you want to switch from biking to running, to store your bike on the street or on a bike rack. You want to get a U-lock if you can, not a cable lock because those can be easily cut if someone is trying to steal your bike. Bicycle gloves – These are optional, but next on my list to buy (don’t have them yet). Especially if you go on long rides, they help with your grip on the handles, they protect your hands/skin from the rub of the handlebars, and they absorb some of the shock when you hit bumps along the road. I think that’s it! I am SO glad I bought my bike – definitely one of the best decisions I’ve made. It’s such a nice break from running, and its non impact. Also, sometimes when I speed by runners, I am sooooo happy to be on a bike going so much faster than I can run! I’ll always love running, but it’s definitely a nice supplement to it. Any other tips for beginners about biking? Especially from more experienced people because I’m such a novice! Or additional questions for people thinking about getting into it? Now, onto my eats for the day! My afternoon snack was a T&C Sandwich with grapes. T&C = Tempeh and Crofters Asia. I had 1/4 of a block (1/2 a serving) of raw tempeh sliced on the sandwich and put THE LAST ( 🙁 )of my Crofter’s Asia on both sides of the bread. It was SO good! It doesn’t taste like much, just adds a nice texture to the sandwich, and definitely adds a LOT of staying power. 1/2 a serving has 11 grams of protein!! And grapes will always have a place close to my heart… love them! After work I went out for a few drinks because my friend Jess finished LAW SCHOOL TODAY!!!!! Congrats Jess!! I am so happy for her, but it’s definitely making me think twice about what I’m doing/start thinking about “the next step”.. I can’t BELIEVE my friends are already graduating from law/grad school.. my how time flies! I had 3 vodka sodas and then called it quits. I was glad I had that substantial sandwich before going because I didn’t get too tispy and was able to stop after the 3 easily. After I left the bar, I was super hungry, so I decided to (against my own rules) stop at Chipotle for some dinner before heading home. I hadn’t been to Chipotle in AGES and when I walked by, it was calling my name, so I went with it. It was soooooo good. Their corn salsa tastes SO good and everything felt so fresh even though it was from a chain… I know I said I wouldn’t eat out BUT I only spent $7 and I didn’t leave the bar until 8:30 and needed to eat before it got too late! But I admit I broke my own rule… and I’m not thrilled about it. No more eating out this week at all… hold me to it!! Nurse Jackie is coming on soon! I’m gonna curl up on the coach and watch some TV. Have a good night!! For lunch today I had a mix of leftovers and things I’m trying to use up since I’ll be going out of town tomorrow. I used almost all of the baby kale I had left to make a massaged kale salad with 2 tsp olive oil and some salt. With the salad I had ~ 1/2 cup rice noodles (leftover from Tuesday’s Lettuce Wraps) and the baked tempeh from last night. I also put a squirt of BBQ sauce on the plate for good measure. On the side, I had the rest of the roasted parsnips and sweet potatoes, also left over from last night. So simple, but so good. I love how roasted veggies get so sweet that you can just eat them plain and they have so much flavor. But then came the best/worst thing to happen… Dr Krackers Pumpkin Seed Cheddar Snackers. From the website, “We toast this cracker while it’s baking to coax the “wow” out of those delicious organic pumpkin seeds, and to get that the most out of that unique, extra-crispy toasted cheddar flavor. Absolutely delicious.” And delicious they were. Do you see how each kracker (I absolutely love writing cracker with a k) has cheese baked on top? Hope Friday is being good to you! Happy Friday Eve! 🙂 My new favorite way to look at Thursday nights. Today has been a really good day, though nothing terribly exciting happened. The highlight (besides lunch) was probably that Farmer’s Market right by my office opened up today, which is so convenient for me. I literally have to walk through it to get to the metro, whereas the one I’ve been going the last few weeks is about a 20 minute walk from my office. Here’s what I picked up from the Farmer’s Market. I did really well and got everything for under $20. I’d never heard of arugula flowers, but they basically grow out of the top of the stalks of arugula and have the same peppery taste but are also pretty to look at. The vendor had some out to try and I thought they were so tasty that I decided to buy some. I also haven’t had farm fresh eggs since… I can’t even remember the last time. I can’t wait to try them! I didn’t want to get too much stuff because I’m going away this weekend for Mother’s Day, but I think I did well with my choices. After getting home from the market, I went on a long bike ride after work and it felt so good! I did 16 miles that took me around 1 hour 15 minutes, which is a 13 mile/hour average. I’m happy with that pace because the wind was blowing hard against me during the first half of the ride and then magically the wind disappeared on my way home when I was hoping it would push me along. The Garmin says I burned 781 calories on the ride, but I recently found out that it calculates your calories burned not by heart rate, but instead by age, activity and pace. I was a little disappointed about that because that means its a lot less accurate than I was thinking. For an afternoon snack, I had a bowl of fruit around 4pm. I just brought in the grapes, but when I went back to get them there was leftover food from a meeting, so I took advantage of the starfruit and kiwis that were on the platter. Yum! Pre bikeride, I had the roll from the Farmer’s Market. I put almond butter on half, and Crofter’s Asia on the other half. This was SO good. The bread was really fresh so the outside was crispy and the inside soft. And with almond butter and superfruit spread? Delicious. After my bikeride, I was huuuungry. I decided to do some roasted veggies and the other half of the block of tempeh I opened last week. For the veggies, I took one large parsnip and one sweet potato and peeled them and cut them into chunks. I sprayed nonstick spray on the pan and then spread them in a single layer. I sprinkled them with salt and pepper, and then threw them into the 400 degree oven. I roasted them for 2o minutes, and then flipped them over and roasted them for another 20. And also added some rice wine vinegar, ponzu sauce (citrus soy sauce), and salt and pepper. I baked the tempeh at 400 for 15 minutes on each side and it came out perfectly. I served the baked tempeh with half of the potatoes and parsnips. Sort of random but it was exactly what I was craving. Everything turned out perfectly and I think this might have been my first time ever having baked tempeh! It’s flavor was delicious with the ginger, rice wine vinegar, and soy, whereas raw it didn’t have too much flavor, but I still liked the texture. I’m off to catch up on the Biggest Loser and then get to bed. Have a good night!! I might start eating breakfast at home more… those pancakes left a smile on my face all morning! To be honest, one of the main reasons I tend to wait until I get to work to eat breakfast is because I figure if I eat at home, I’ll get hungrier for lunch a lot sooner than 12. But I think I enjoy my breakfast and have more fun throwing it together when I make it before work. Today I had those pancakes around 8:15-8:30, and was pretty full until 11:30am or so. 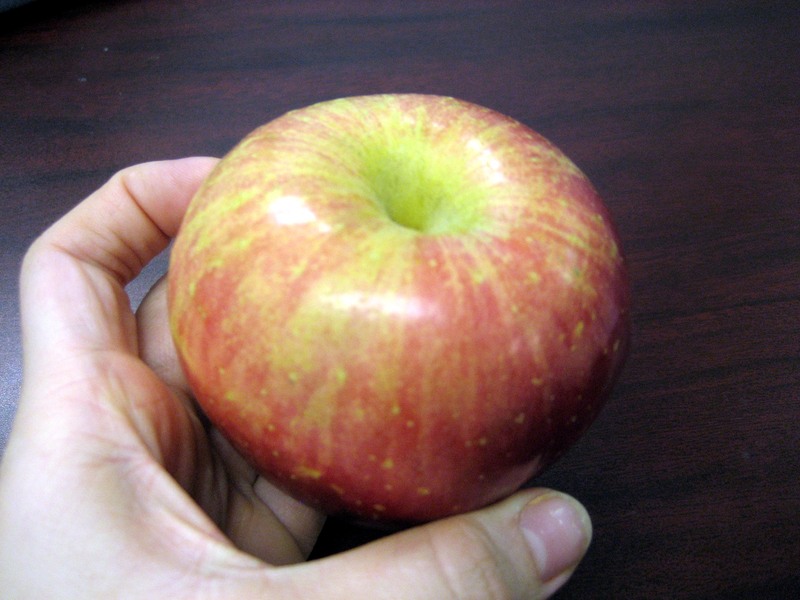 I had an apple for a snack around then, and it held me over until 12:30 for lunch, so it worked perfectly. This was a fuji apple from the farmer’s market yesterday. What a huge difference in flavor this was from the apples I usually get at the grocery store! It was so sweet and crispy and just delicious. Even when I buy organic apples from the grocery store, they don’t come close to this taste. I’m so excited to have 3 more of these! Lunch was pretty interesting. I threw it together last night before Bikram because I knew I’d be too tired to put it together after I got home. I didn’t know exactly what I was going to make, so I just started throwing some ingredients into the food processor. I added a handful of kale, baby carrots, and 1/2 cup of chickpeas. I pulsed it until it was ground up together, and then I added 1 oz of light feta and 1/2 serving of tempeh, crumbled up. I seasoned it with some salt and pepper, and then let it sit overnight. I decided to name is Crumbled Tempeh Salad. Though quite random, it was delicious and completely raw. I ate it with some Wasa Crackers. I just discovered these in my cabinet and had completely forgotten about them. I love wasa crackers because they’re so crunchy and light, and were perfect for scooping up this salad. I also had a Massaged Kale Salad on the side to use up the last of the kale from last week’s farmers market. Unfortunately, this was a total fail. I must have majorly overdone it with the salt without realizing. I still ate the salad, but it left a bad taste in my mouth. Sad. They compeltely hit the spot without making me feel like I overdid it. I also grabbed a Venti Iced Green Tea from Starbucks. Which I’m currently drinking as I finish up the last few hours of work for the week! <3 Fridays. This package has 2 servings, but I actually only had 1/2 a serving on my sandwich. There are 240 calories in a serving, 11grams of fat, 9 grams of dietary fiber, and 20g protein. So 1/2 a serving had 120 calories, 5.5g of fat, and 4.5g dietary fiber, and 10g of protein. Plus some Pirate’s Booty which was sent to me as a sample. Bigger lunch that usual today for me today but I’m seeing if I testing out to see if a bigger lunch will make me less snacky later in the day. The verdict on the raw tempeh sandwich – delicious! Honestly, I barely tasted the tempeh in there but it added a nice texture. I think using it on a sandwich when in a crunch is an awesome vegetarian option in place of lunch meat like I used to have. I was hesitant to eat it raw, but with all the veggies packed on there, I only really noticed the texture. This will definitely be a new lunch staple for me since its so easy and requires no cooking. The Pirate’s Booty was not my favorite. I love most Pirate’s Booty, but the Sour Cream and Onion flavor just didn’t do it for me. It was kind of sweet, but in a weird way. I’ll just stick with regular or Veggie Booty going forward! The carrots and mandarins were great, though. Can’t go wrong with fresh produce! I’m thinking about going to Bikram AGAIN tonight!! I realized I left my water bottle there last night, so I have to go back anyways to pick it up. It’s $15 for a drop in class, so I think I’m going to take the plunge and do it. I’ve been thinking about the postures all day and can’t wait until I can improve on them. I think I feel a new (expensive) addiction coming on. Hope your Thursday is fabulous. Be back tonight! !